When I was a kid, I didn't have much fondness towards stuffed toys. My mom kept me away from them because she said they easily collect dust. I almost got brainwashed from her not until my hubby insisted to let baby play with the stuffed teddy bears that my friend gave me during baby shower. After playing with these stuffed toys for quite sometime now, we noticed how baby has grown an affection and love towards them. 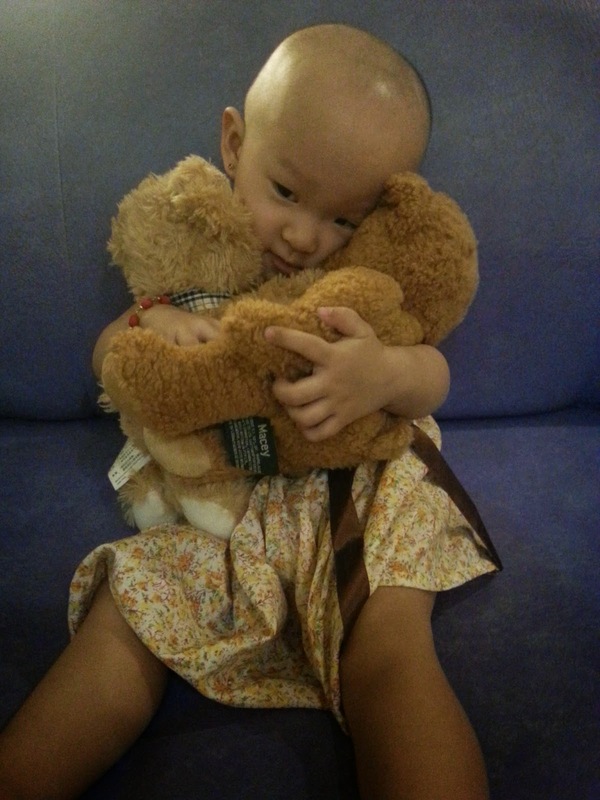 It's very heart-warming to see when baby hugs and kisses her teddy bears just like the photo below. 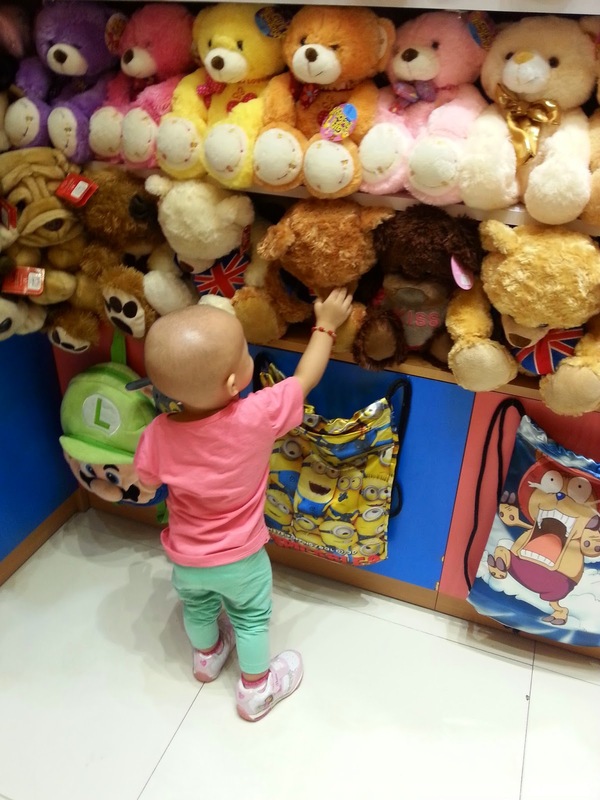 Once, we strolled her to the mall and spontaneously entered a store that sells various stuffed toys, we saw how she was able to recognize and identify those cuddly teddy bears as if all of them were her friends. That's where I realized how teddy bears could brighten up and bring a smile to a child and even us adults. 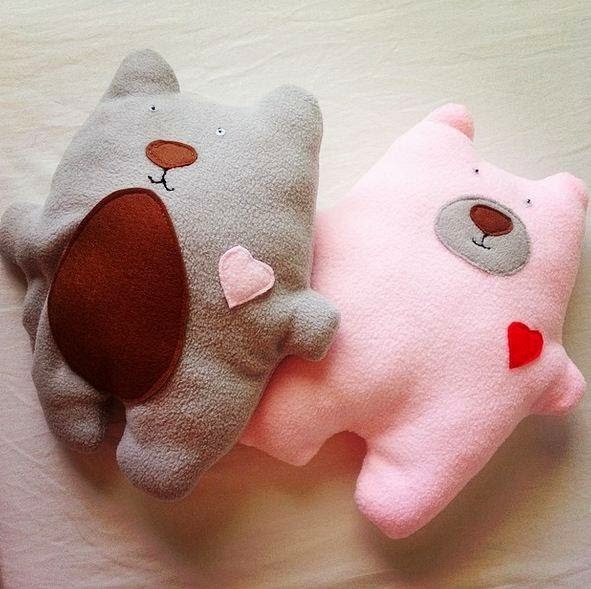 And speaking of teddy bears, have you thought of creating one for yourself? Because Manila Workshops, in partnership with Luna and BE ME, would be having a workshop that will teach both kids and kids at heart on how to create their own teddy bear. 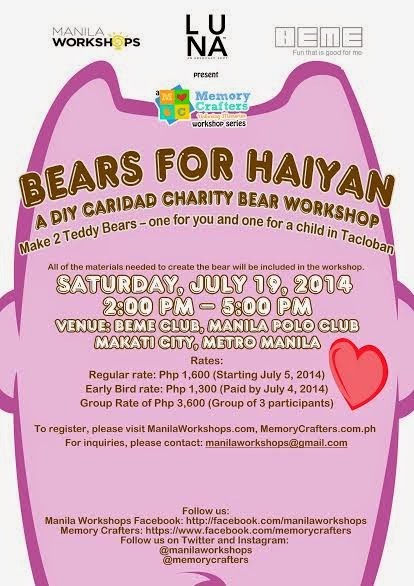 The event, entitled Bears for Haiyan: A DIY Caridad Charity Bear Workshop, will be held on July 19, 2014 (Saturday). Still remember Typhoon Haiyan or more commonly known as the Typhoon Yolanda last Nov. 2013 that left thousands of people from Tacloban, Leyte homeless? It may have already happened months ago but the catastrophic damage it had done can still be felt. Continuous effort and support must be done to be able to erase the traumatic experience and get them back to their normal lives. In this workshop, you not only learn a skill in making your favorite stuffed animal but you also get to make another child happy as part of the proceeds will be donated to the children in Tacloban. Let's be an instrument of happiness to these kids by signing up to this workshop. Luna is an advocacy shop aiming to encourage the use of Filipino language and to ignite the genuine Filipino in each one of its followers and urge them to make a difference in the lives of their fellow countrymen. 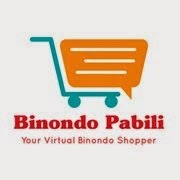 It was founded by Maria Couline Gloria who is on her last term at the De La Salle University. She will be graduating this October and is currently working in Gymboree as a pre-school teacher. BE ME is an activity workshop/studio for both kids and adults ages 5 and above. It offers a wide range of constructive fun activities like woodwork, arts and crafts, and a whole lot more. If you want to learn more about crafting, this is definitely the place to be. They have 3 locations already: Manila Polo Club, Rockwell Club and Sofitel Manila. Here's the sample DIY Caridad Bear. How cute! Feel free to share this to your friends who are interested. May God bless you a thousand fold!